During my childhood, the two main stopping places on the road between Cappoquin and Dublin were Cashel and Thurles. It was a journey of perhaps 240 km journey, and although Cashel is only 52 km from Cappoquin and Thurles about 75 km, they seemed to mark the halfway mark. I have vivid memories of being brought through the ruins on the Rock of Cashel and picnics that seemed to mark the beginning and the end of summer. Thurles was a very different place to break the journey. We usually stopped in the car, but I can recall occasional stops during long journeys. 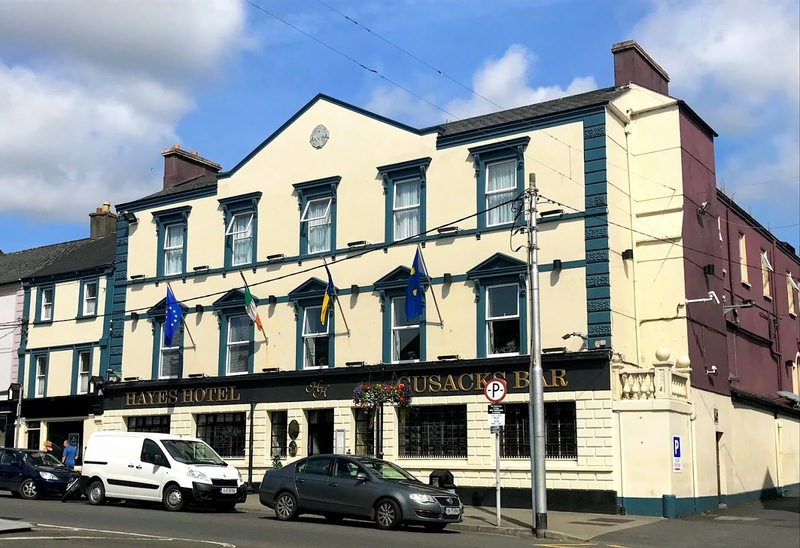 The treat on those days was being brought into Hayes Hotel on the main square in Thurles, and seated to lunch at an hotel table. These occasional stops were made to feel like true occasions. I readily recall fair days in Thurles, with the cattle, the farmers, the dealers and the smells. 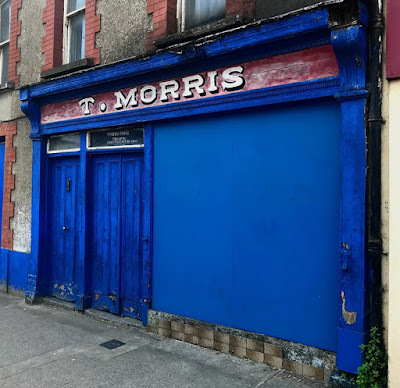 For a boy in the 1950s and the early 1960s, a town like Thurles seemed to be nothing less than a bustling metropolis. Walking through Liberty Square this week, it had lost none of its feelings of being a broad square surrounding by elegant Victorian and premises. 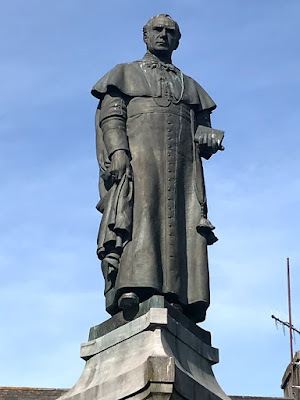 The sounds and smells of market days came back to my mind, and I knew immediately where to look for Hayes Hotel – still pronounced by all as ‘Hayses Hotel’ – and the statue of Archbishop Croke and the 1798 Memorial. But, truly, is it a change for the better that this square, planned as a broad open space, is now used as a car park that serves as a traffic island. Had I not known this town as a child, I imagine, it would have been difficult to appreciate the breadth and majesty of the hotel. Hayes Hotel is a five-bay, three-storey hotel on the north side of the square, built around 1840. It has a pitched artificial slate roof with rendered chimneystacks, a moulded eaves course and a central pediment. There are rendered walls with quoins on the upper storeys. The ground floor had rusticated concrete block cladding and a black marble plinth, and there is a glazed cast-iron entrance canopy. 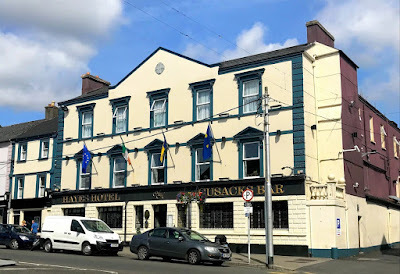 Hayes Hotel has a claim to a special place in Irish history and culture as the place where the Gaelic Athletic Association (GAA) was founded by Michael Cusack and Maurice Davin at a meeting on 1 November 1884. At the time, this was known as the Commercial Hotel. It remains the single most important building in Thurles today, and remains as a popular meeting place. Although the ground floor has been extensively remodelled in recent years, the upper storey retains many of its original ornamental features. At the west end of the square, the Archbishop Croke Memorial was erected in 1922 to commemorate Thomas Croke (1824-1902), Archbishop of Cashel (1875-1902). Croke, who was born in Co Cork and educated in Paris and Rome, and was a professor of theology in Saint Patrick’s College, Carlow, and President of Saint Colman’s College, Fermoy, before becoming Bishop of Auckland in New Zealand. On his return to Ireland, he became Archbishop of Cashel, and became known as a strong supporter of the Land League and the Home Rule politics of Charles Stewart Parnell. He also became a leading supporter of the new GAA after it was founded in Thurles in 1884, and Croke Park in Dublin was named in his honour. In honour of Croke, his successors as Archbishop of Cashel were invited to throw in the ball at the start of All-Ireland finals. The high-quality, larger-than-life bronze statue of Archbishop Croke was cast by the sculptor Francis William Doyle Jones (1873-1932). Doyle Jones was born in Hartlepool in 1873, the eldest son of Francis Jones (1846-1918), a stonemason and sculptor from Co Monaghan. Doyle Jones initially worked for his father and then studied in Paris and London in the 1890s. He worked principally as a sculptor of portraits, and also made a large number of war memorials. He died in Saint Luke’s Hospital, Chelsea, in 1932. 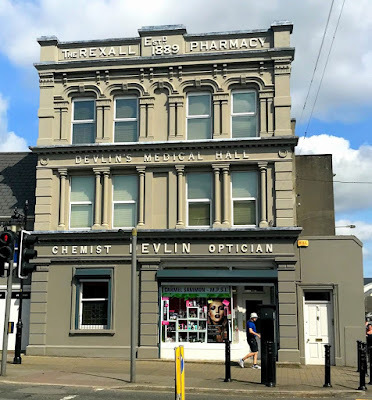 A few steps east of Hayes Hotel, the Rexall Pharmacy or Devlin’s Medical Hall is a landmark with its elaborate Italianate façade, including the parapet with raised lettering, the plinth, arched window openings, paired pilasters, keystones and timber-framed plate glass windows. Inside, the shop retains many of its original features. But the façade, which is dated 1889, hides the fabric of an older structure. The ornamental colonnade and arcade may have been influenced by the then new Cathedral of the Annunciation. Across from Devlin’s, on the south side of the square, First Editions at No 19 is now closed and the building is on the market. This terraced, two-bay, three-storey former house was built around 1890. The building has a pitched slate roof with rendered chimneystacks and a distinctive curvilinear gablet with a ball finial. 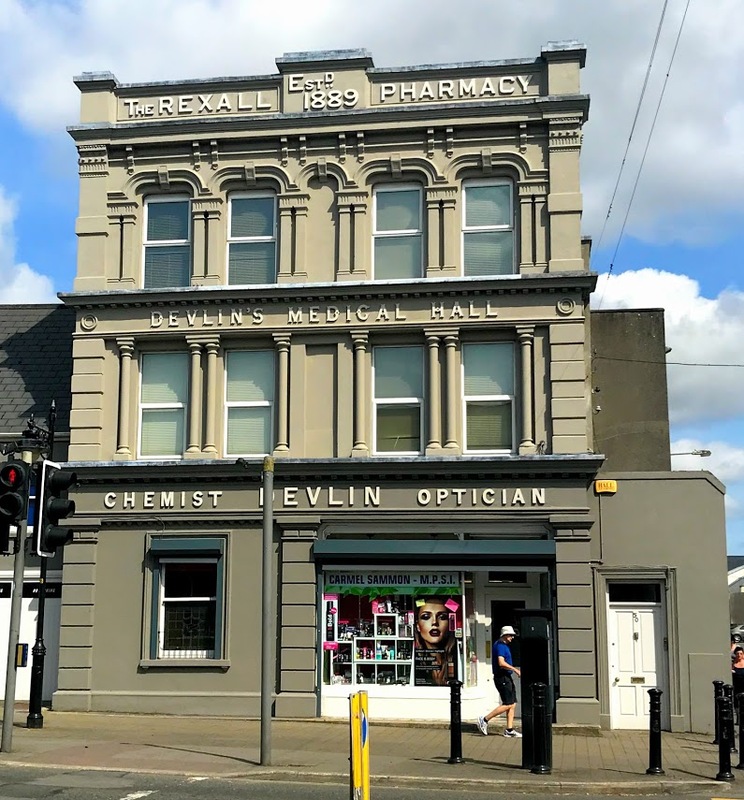 The shopfront has a plate glass window flanked by recessed doorways that have timber panelled doors with overlights, flanked by carved timber pilasters. 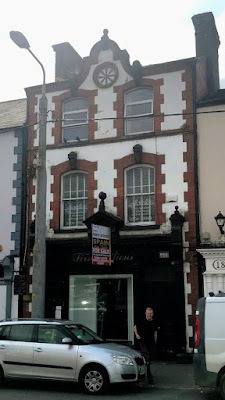 This is an unusual building in Thurles, and its design seems to have been informed by Dutch influences. The decorative gablet and the brick detailing with the oversize keystones show a high degree of craftsmanship. The doors flanking the plate glass window are reminders of the days when shopkeepers lived over the shop – the days when I was a boy on the road between Cappoquin and Dublin, and when we stopped in Thurles to be treated to a fine lunch in Hayes Hotel.